Hayai has developed a turn-key hotspot solution which allows your business to offer both free and premium paid Internet to your customers or residents. Whether your business is a hotel, bar/restaurant or apartment complex, Hayai's system can scale with your business as it grows or as customer demands increase. 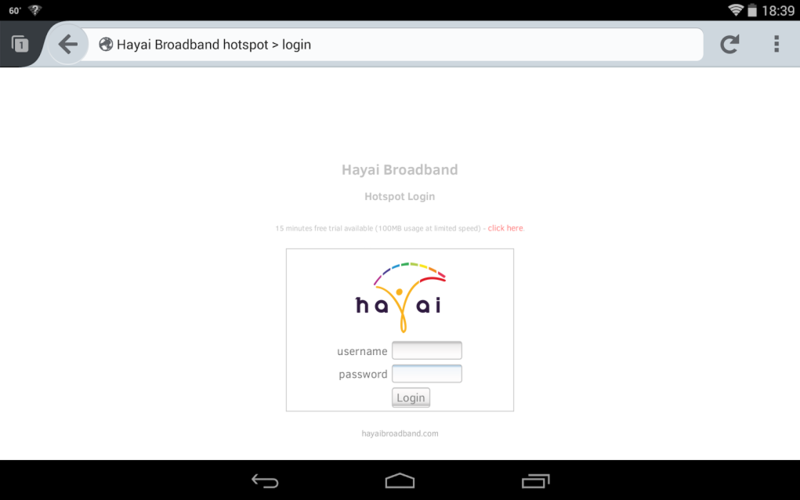 You can limit bandwidth to each client to prevent your connection from being saturated as well as mitigate attempts to use the network for nefarious purposes or illegal downloads, with several options available for security (whether you want to use one-time logins, a username/password combination or a simple "I accept" button), Hayai makes it easy for you to offer easy access without allowing prying eyes anywhere near your internal data. Hayai takes care of everything, from contracting the installation (if required) and city permits (if required) to deploying the network throughout your premises. Call us on (217) 717-9379 to find out more! If a site survey has not yet been performed or if documentation is not available, Hayai may require a preliminary visit in order to complete a site survey before providing an estimate or undertaking work. Allowed file types: gif jpg jpeg png txt rtf pdf doc docx odt ppt pptx odp xls xlsx ods gz rar tar zip. Is hardware & configuration required? If heavy equipment (such as scissor lifts and other safety devices) is required, will this be on-site or required?